Stuart Timmons was an acclaimed historian and award-winning author of “The Trouble With Harry Hay” and co-author with Lillian Faderman of “Gay L. A.: A History of Sexual Outlaws, Power Politics and Lipstick Lesbians” (winner of the 2007 Lambda Literary award for LGBT Arts and Culture). Both his writing and research have appeared in numerous literary sources such as LA Weekly, The Advocate, Frontiers, Vibe, and Spin and his short stories have appeared in various anthologies. Stuart was a board member & executive director of the ONE National Gay and Lesbian Archives. 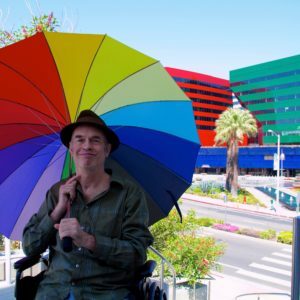 In 2007, Stuart was developing three walking tours of LGBTQ historic sites in Los Angeles. He finished tours of DTLA and Silver Lake, but experienced a severe cerebellar stroke in January of 2008 before he could complete his West Hollywood edition. In 2015, for the 30th Anniversary of the City of West Hollywood, Stuart and a dedicated team of volunteers led by Jason Jenn completed the tour thanks to a grant from One City One Pride LGBTQ Arts Festival. Stuart enjoyed being back on the social scene in recent years, and made several notable appearances at events that benefited from his work as a historian. However, on January 28, 2017, shortly after his 60th birthday, the ongoing challenges to Stuart’s health proved too difficult and he died from cardiac arrest. His final years were enriched by connection to friends, his family, The City of West Hollywood, and organizations like The Lavender Effect and ONE Archives that will continue to carry forth his legacy.